If you’re stopping by from Whimsical Blue Living – welcome! My name is Oksana – I’m a designer, blogger, wife and quite the passionate proponent of embracing life’s little luxuries. Thank you for visiting FOXYOXIE.com; I hope you find just the inspiration you’re looking for – whether it’s to tackle your next home improvement project, explore a new travel destination or discover what it means to be a lady in the modern world. I launched FOXYOXIE.com with hopes of inspiring women to never settle for mediocrity – whether in the home, wardrobe, workplace or personal life. Though formally trained in graphic design, I’ve since fallen in love with interiors and styling. In July 2015, the husband and I purchased a 1930 bungalow that previously stood abandoned for 20 years. Since then, we have worked to bring the house back to life, tackling DIY projects like nobody’s business and documenting the fun (and not-so-fun!) adventures on the blog. To catch up on what we’ve renovated so far, check out the full “Our Bungalow Renovation” series. Now, let’s talk about the real reason you’re here: our winter home tour. This Christmas is our first in our new (old) house. Being a sentimental person, I was excited to re-discover holiday decor in a setting that felt more permanent than ever before. 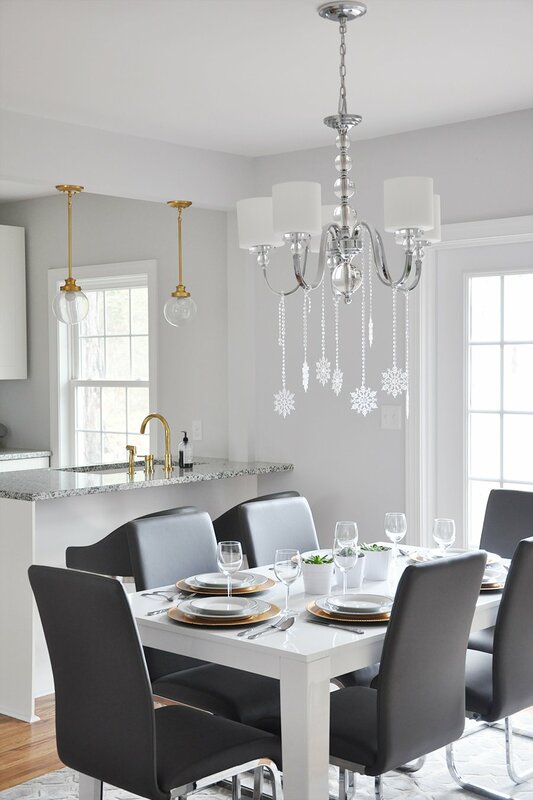 Although we’ve never been the “let’s-buy-a-house-and-settle-down” type of people, there’s something special about decorating for the holidays in your very own home – especially one we’ve spent the last 18 months renovating. Of course, I started with the tree. Growing up, our family wasn’t really into Christmas decor; we stopped putting up a tree and exchanging gifts right around the time I turned 12. My husband’s family, however, was always very much into it, and I’m so happy he brought that tradition into our own family. He honestly gets more excited about choosing a tree than I do. His enthusiasm is infectious – so much so that we have an entire ritual of hauling said tree back home, complete with hot beverages and Christmas music. It’s a load of fun! Russian tradition dictates that the holidays aren’t over until January 14, which is the Russian Old New Year, and so we don’t take down our tree until then. As a result, I try to keep the color palette neutral for a classic and timeless feel that could extend far beyond Christmas. I bet you’re wondering what in the world is the Old New Year – am I right? Sure, it sounds like an oxymoron, but January 14 marks the changing of the year according to the old Julian calendar instead of the Gregorian calendar that the world officially uses today. More than anything else, New Year in general is a very nostalgic time for the Slavic people, so it’s only appropriate that the former holiday has a special place in modern Russian culture. A surprisingly vast majority of Russian people observe the Old New Year in some way, as do many of the former Soviet republics, including Ukraine, Armenia, Belarus, Moldova, Georgia and Kazakhstan. There’s your history lesson for the day. Now, let’s return to the tour, shall we? The area I was most excited to decorate this year was the fireplace mantle – a sweet first for me. 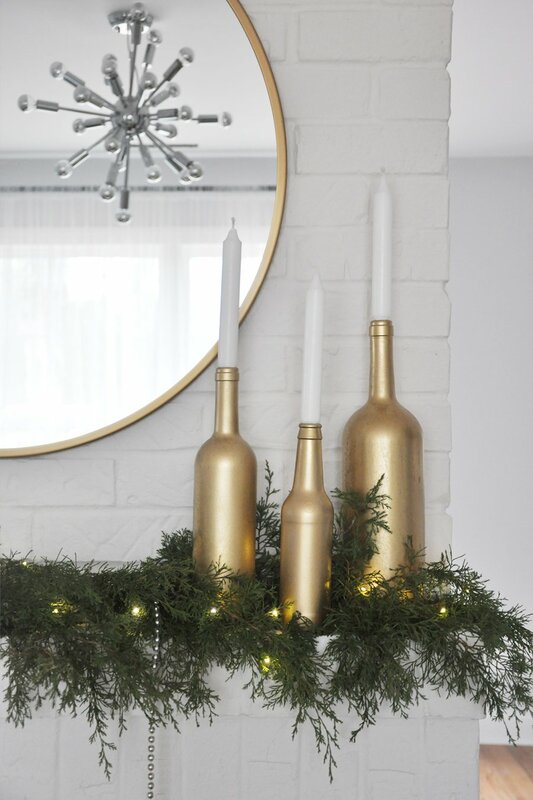 I had dreamed up a modern, luscious garland for the space, with pops of gold and silver, layered white candles and miniature lights – basically, pure magic. But I couldn’t figure out where to get a load of live branches without paying an arm and a leg for it. Then it occurred to me: Our property includes nearly seven acres of woods (the main reason we bought this house in the first place); I had more than enough evergreens to choose from in our own back yard! Instead of using floral wire to craft the branches into a garland like I originally planned, I layered the branches instead, which made for a fuller arrangement and gave me more control over the end results. Truth be told, I only figured out this fact after attempting and failing to bind the branches together. You live and you learn, as they say. It’s a good thing I have lots of gold- and silver-colored accessories year-round, which makes seasonal decor effortless. A hand-lettered chalkboard sign here, an arrangement of greenery there, and voilà! 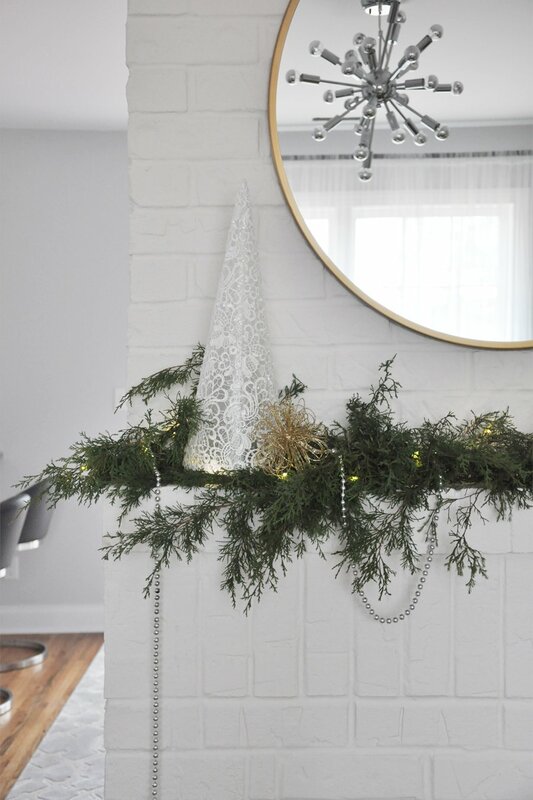 You’ve got a fresh, understated holiday vignette! Let’s make our way into the dining room. On one side of the buffet I replaced my typical arrangement of vases with modern, miniature Christmas trees, of which my favorite is the rosemary tree. Thank you to ProFlowers for the lovely gift, which arrived on our doorstep a mere two days after I ordered it. To balance out the vignette on the right side of the buffet, on the left I layered yet another hand-written chalkboard for a touch of personality, wrapped gifts for added height and a festive candle for coziness. 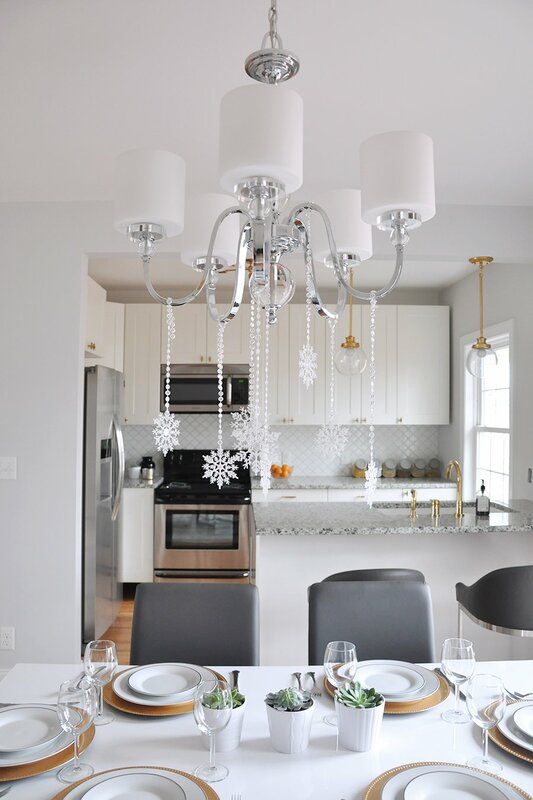 Taking full advantage of the chandelier over our new dining table, I wanted to add a hint of sparkle. I cut up a crystal garland from our wedding four years ago and glued snowflakes to it, tying them at various lengths from the chandelier arms. This installment has become one of my favorites – I love the way they twirl and catch the light! For the dining table, I once again kept the decor simple (are you noticing a recurring theme? ), layering silver-rimmed china over gold chargers, adding our monogrammed flatware and traditional glassware. Instead of an extravagant centerpiece, I chose a more modern approach, lining up three succulents in a row to add a bit of visual interest to the table. That, ladies and gentlemen, concludes our tour today. 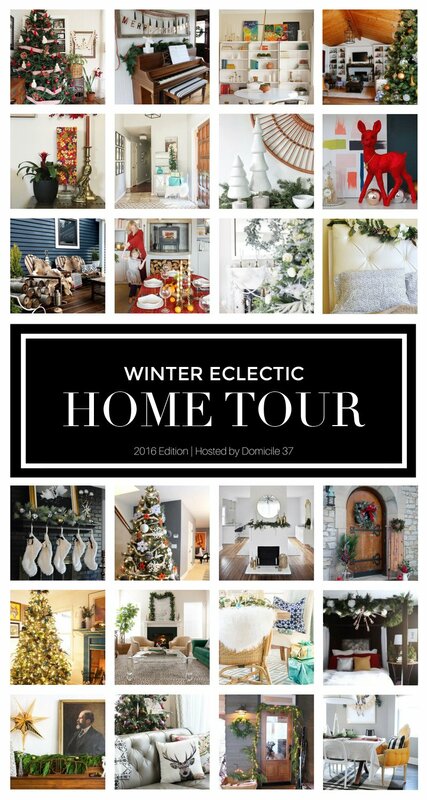 Huge thanks to Jess from Domicile 37 for inviting me to participate in the winter home tour blog hop this year. 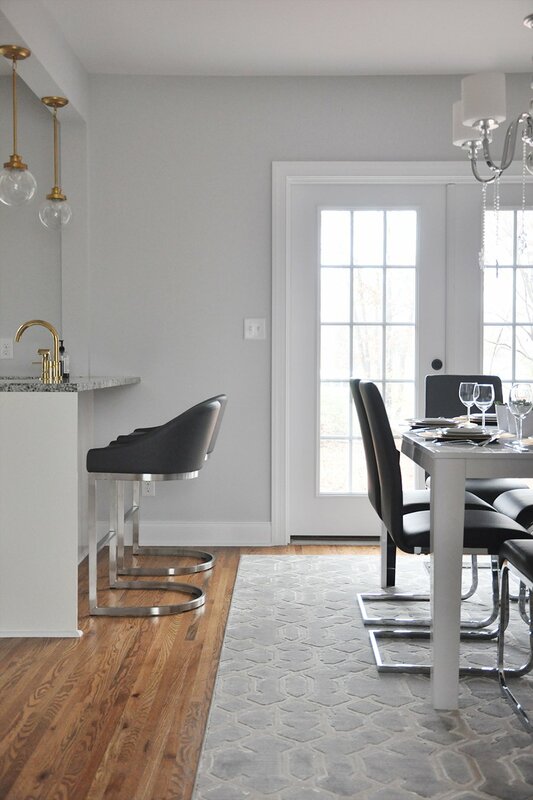 Make sure you stop by the other ladies’ blogs to see all their fabulously styled homes. Posted in HOME DECOR, PARTIES, ENTERTAINING + SPECIAL OCCASIONS and tagged FIREPLACE, HOLIDAYS. Great decorating suggestions. I love all the ideas, can’t wait to go back through the post and get the full instructions on everything. Thank you for sharing! Oh it’s just the right amount of holiday touches! So elegant and classy. So elegant and chic! Love this color pallet for the holidays and year-round. Beautiful home! Happy holidays! 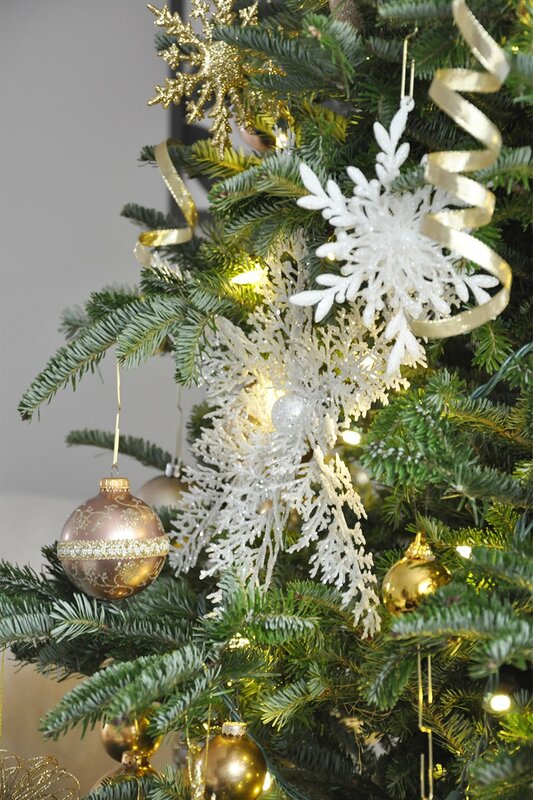 I love how easy it is to decorate with garland – you can even include those dainty fairy lights. It’s so much easier now (than I feel like it was when I was younger) to add subtle bits of festivity to your home this time of year. I’m so glad we were on the same Christmas tour, your home is beautiful! 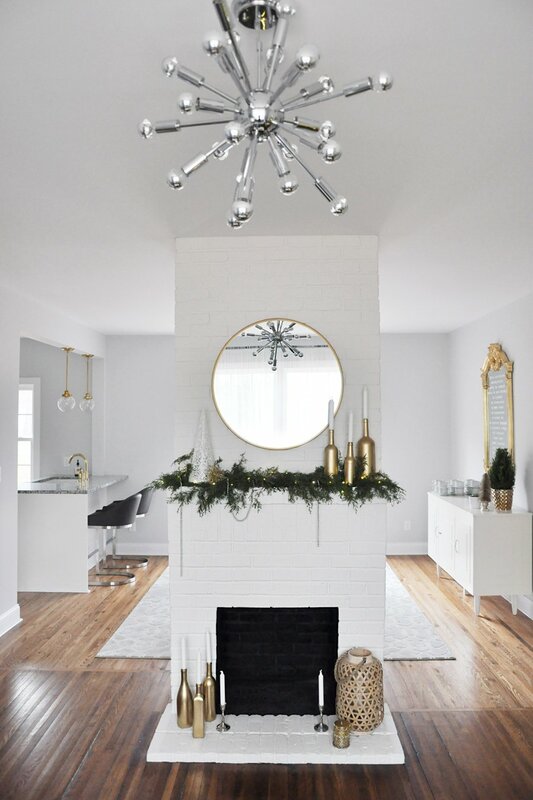 I love the white brick fireplace, and your gilded mirror is so lovely. Happy Holidays! Oksana, your home is a dream! Gorgeous decorating throughout, and I’m sure the renovations you’ve made thus far have created the pallet for such a beautiful setting! I especially loved hearing about your background, and the traditions your family celebrate. Thanks for sharing it all! Major house goals! Your home is so beautiful!! I love seeing what other people do for holiday decor!! And the story about how your family celebrated the holidays was so sweet! 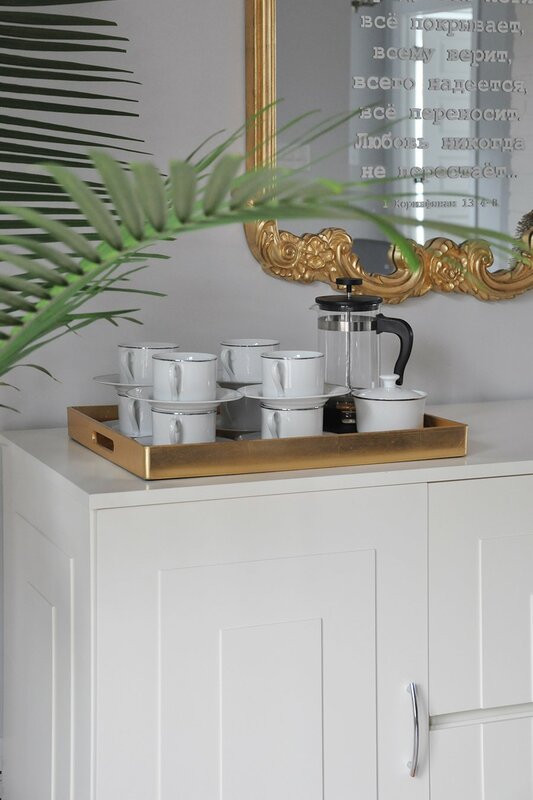 The gold and white decor works perfectly in your space, it has always been a favorite combination of mine. Such an elegant tour! I love I’ve lovd your home decor! I’m planning to do a home tour myself once my decor is complete! Your decor is fab, I am so jelly!!! yes to everything! Looks perfect. Your home is so incredibly chic! Elegant, fresh and so well-edited. 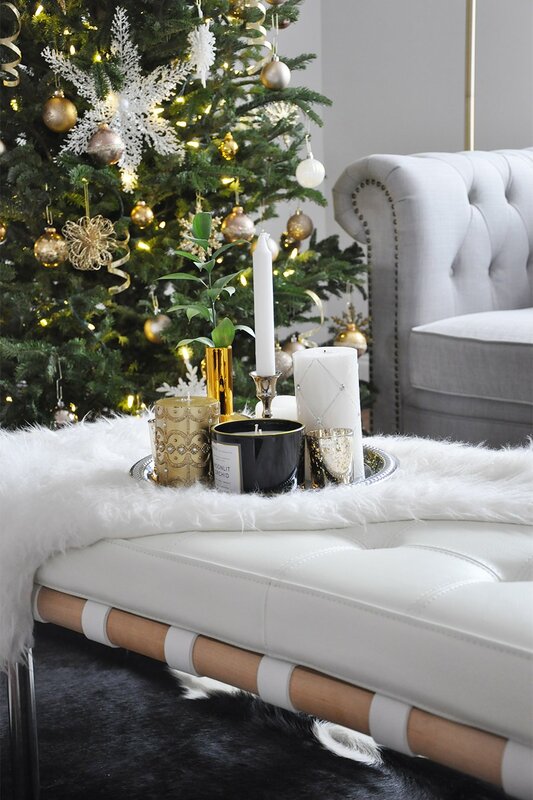 I just love your minimal but glamorous holiday touches…beautifully done! 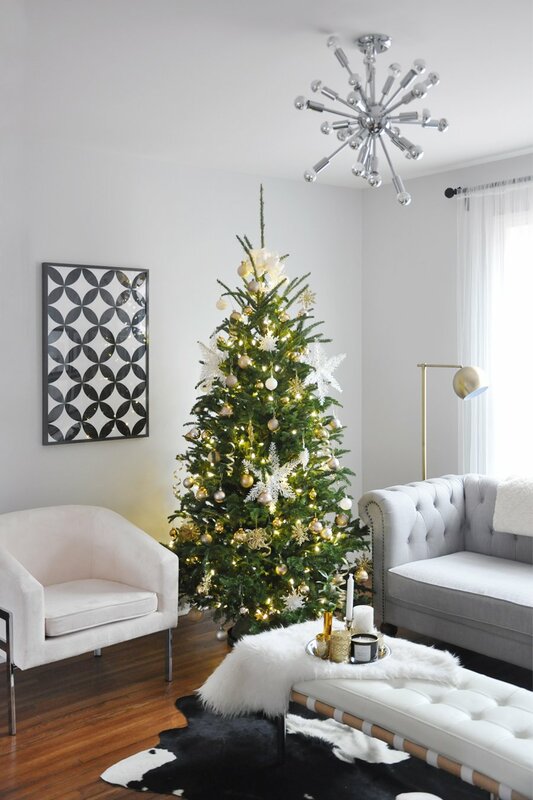 I’ve always been impressed with your home tours but your Christmas decor makes it all the more stunning! Beautiful! I love your fireplace! And your tree is gorgeous. The pendant lights in your kitchen are so pretty too! I’m excited to read your series about your renovation! Your tree is beautiful!! Love the gold ornaments. And I love the greenery on the mantle…we need to get some at my place! 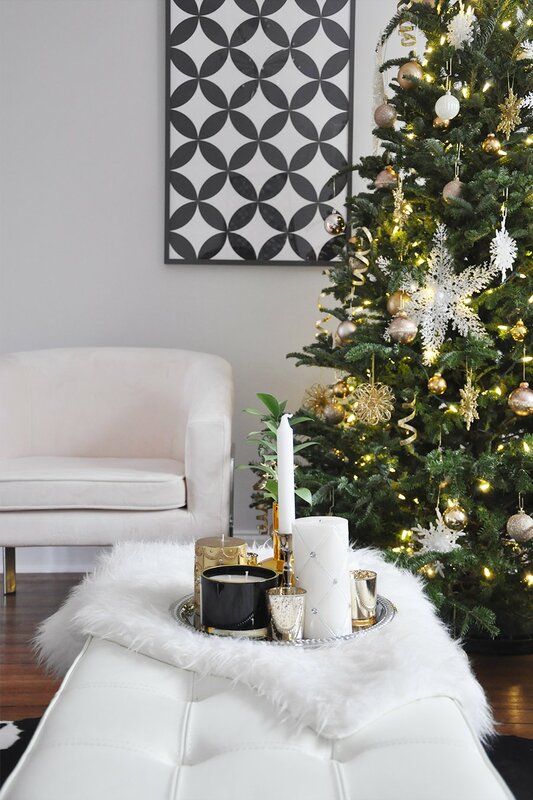 Your holiday decor is so chic and glamorous! Can you come decorate my house?! Beautiful tour! 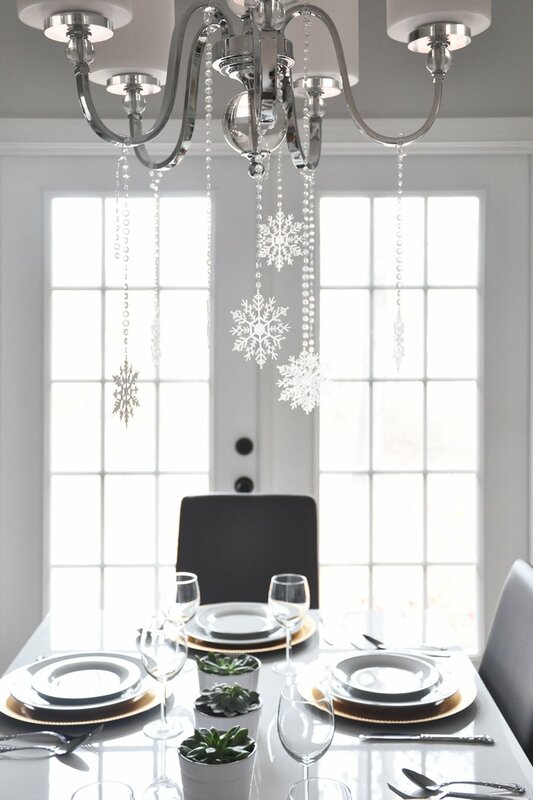 The snowflakes over the dining room table are just gorgeous! And I love your glamorous touches everywhere! Such a cute tree! The ornaments are gorgeous! Also, I love your fireplace – it looks like the placement would really warm up the whole house in winter!! 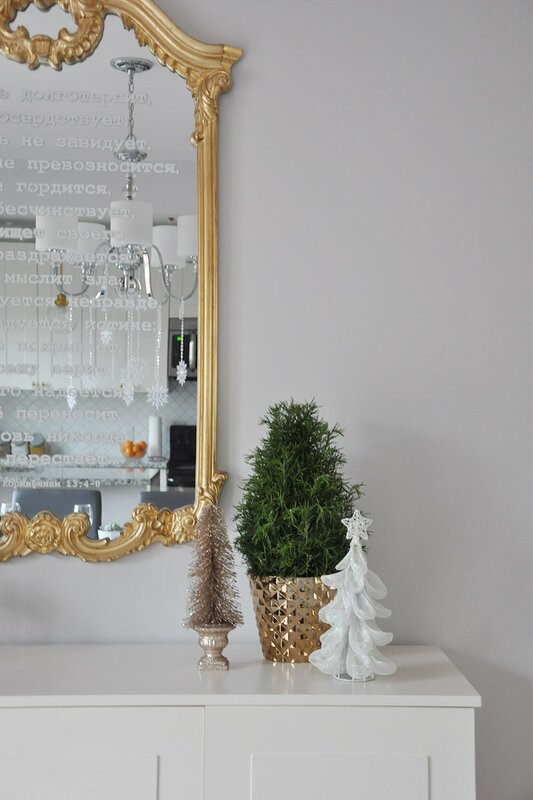 Oh Oksana, your decor is stunning and elegant! I hope you are going to host some festivities in your beautiful home this year! I love it!! Nice work! I love the Christmas tree and all the Gold decorations! I love your clean, modern approach to holiday decorating. I also think your photography is gorgeous and is magazine worthy. I am so happy to have you participate and share your culture with all of us. 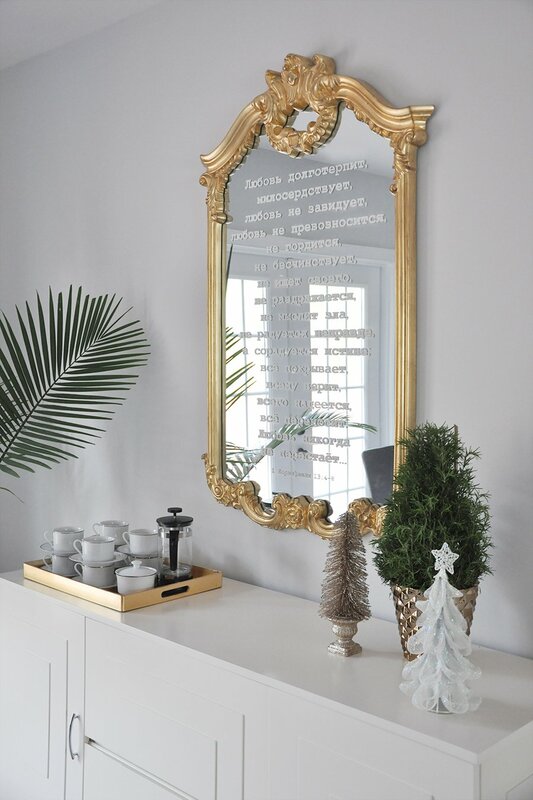 I enjoyed reading about the Old New World and Christmas background story…and what a cool way to deck that mirror out! Absolutely lovely! I am swooning over your style. I love how chic and elegant your use of decor is. Beautiful!!! Beautiful! I love the vignettes with the new buffet and the fireplace. All very chic! I especially love that the tree has a meaning to you and your husband. So many people just yank a fake one out from storage, but we still make the pilgrimage to pick one out.